The Jergens Spring Loaded Work Jacks provide consistent support and rigidity to odd shaped workpieces. They are designed to prevent workpiece deflection under forces created during machining operations. Precision mated locking jaws grip the jackpost from both sides creating a vise-like action. Jergens work supports (25201, 25203, 25207, 25205) are designed for use as a secondary support and are not intended to be clamped directly over as you would with a fixed locator. To avoid part movement work supports should be actuated and locked out only after all clamps have been secured. This procedure will minimize any movement that may occur when tightening the work support to the desired torque. 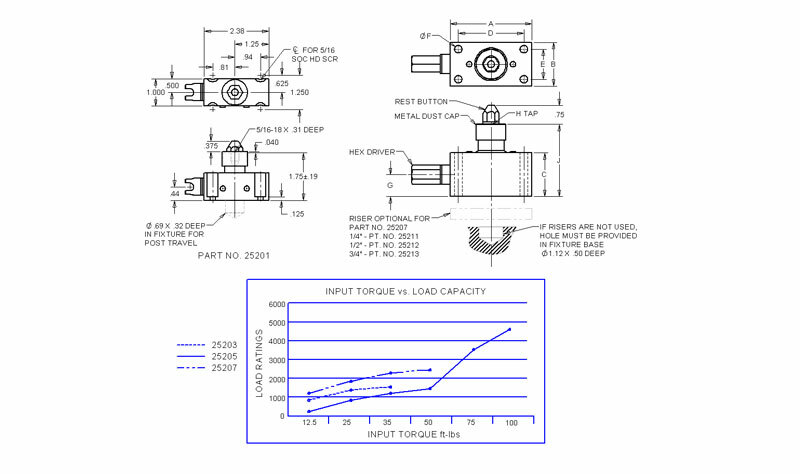 When described procedure is followed work supports can be expected to hold tolerances as tight as .001”-.002”.